Default images are boring. Let your customers examine your real products in 3D mode right on sites. VM Products 3D Images helps to display your products in 360o view, easy for customers to have an overview of your products. The better the image, the better you will sell. Relied upon by VirtueMart store owners, Our VM Product 3D Image Plug-in has been the professional choice for stylish spin, zoom & full-screen effects for recent years. We offer the best price on the world market, just $43.3 and you have it on your website. Of course, our professional team is always available to provide support and help you fix any minor errors. 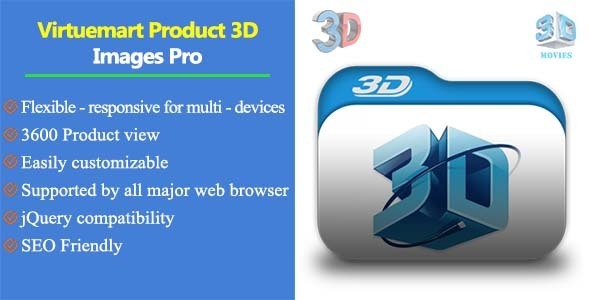 VM Product 3D Images plug-in is responsive for multi-device: PCs, Laptops, Tablets, Mobile Phones. Admins can change images dimensions, manage images upload sizes. Enable/Disable Plug-in on different pages & sections of your VirtueMart store. Even better, customize it differently in each section/page. Our plug-in is fully compatible with the 4 most popular web browsers now: Chrome, Firefox, IE, Safari. No more errors on compatibility.